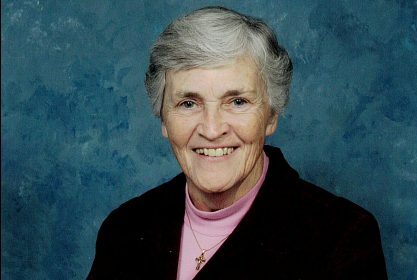 Sister Nora Friel, was born and raised in Philadelphia, and graduated from Cardinal Dougherty High School where she met the Grey Nuns of the Sacred Heart. While studying for her B.A. Degree in English from Rosemont College, she taught at Our Lady of the Assumption School in Strafford and at Mother of Divine Providence in King of Prussia, both in Pennsylvania. After a short time as bookkeeper at Grey Nun Academy in Yardley, Pennsylvania, she qualified for a social work position in the Office of Children and Youth in Montgomery County. There she worked in Placement Services where she facilitated securing safe homes for children who had been abused or neglected. Following fifteen years in that capacity, she devoted her skills to serving another at-risk population when she transitioned to the Office of Adult and Aging Services as a supervisor. She continued in this ministry serving an equally vulnerable senior population for nine years on a full time basis and for another seven years part time. Since her retirement, Sister Nora offers support to the Grey Nuns of the Sacred Heart by working in the Finance Office on a weekly basis. When Marguerite d’Youville walked through the streets of Montreal, her heart went out to the plight of society’s most vulnerable members: the poor, the needy, the children, and the elderly. My experiences in the social services were truly one of the greatest blessings of my life. I look forward to the Jubilee Celebration of my fifty years as a Grey Nun of the Sacred Heart as an opportunity to express my gratitude to Our Lord for my vocation in the presence of our community and of my family and friends. My love and congratulations to you on your 50th Jubilee as a Grey Nun of the Sacred Heart. My best to you in the years ahead. I miss you ….would love to meet for lunch sometime.